Founded to help architects and engineers understand the value of design technology. 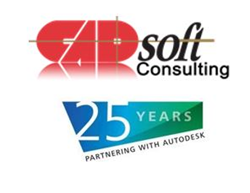 CADsoft Consulting Inc., a proven leader in the implementation of design and construction technologies, is excited to celebrate its twenty-fifth anniversary as an Autodesk Value Added Partner. CADsoft Consulting was founded in 1991 to help architects and engineers understand the value and how to best implement Autodesk software that was still delivered in a box. Since then, CADsoft has grown into a flourishing leader in the industry, with a team of technology experts who have backgrounds as architects and engineers offering intelligent solutions and services based on broad industry expertise and extensive product knowledge. Competing in today’s market requires partnering with companies that can help the AEC community understand design solutions, processes, and technology that enhance productivity and optimize operations while transforming the way they do business. Autodesk and the Autodesk logo are registered trademarks of Autodesk, Inc., and/or its subsidiaries and/or affiliates in the USA and/or other countries.